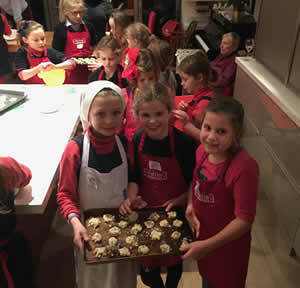 Emma’s kitchen loves hosting children’s parties. We take up to 20 people of any age and Emma designs the party according to age, ability and your requirements. A take away party bag for every partygoer of all the food cooked by them during the party. Emma’s children’s parties offer something different. It’s informative, educational and most importantly, GREAT FUN. Please get in touch to discus to discuss dates, requirements and prices. "I wanted to say a massive thank you to you and your lovely team. It was the most brilliant party she has ever had. She loved every minute and so did her friends. The mums said I have really set the standard now – oops!!! Anyway it was lovely meeting you and I would like to get a group of friends together to do an evening with you." "Thank you so much. I've already had comments that it was the best party ever from Isla and others!" "I just wanted to say a huge belated thank you to you all. The kids absolutely loved it. My daughter is quite shy, and she normally doesn't enjoy her own parties but she loved this one. We are just finishing up the cupcakes... It was all so delicious. Thank you again. I would hesitate to recommend you to anyone who was looking for a party (for child or adult)." "What an amazing party Emma!!!! I have had so many messages to say the children had the best time ever! It really was absolutely wonderful! Thank you very very much. Everything from the food to the fun to the party bags it literally couldn't have been better. Thank you very very much."